My best friend recently moved back to Boston from San Francisco, and I knew she would be one of the few people who would splurge with me on a food based activity. It’s ok to spend almost $100 on a meal if it’s justified by a special occasion. So… Merry Christmas to us! 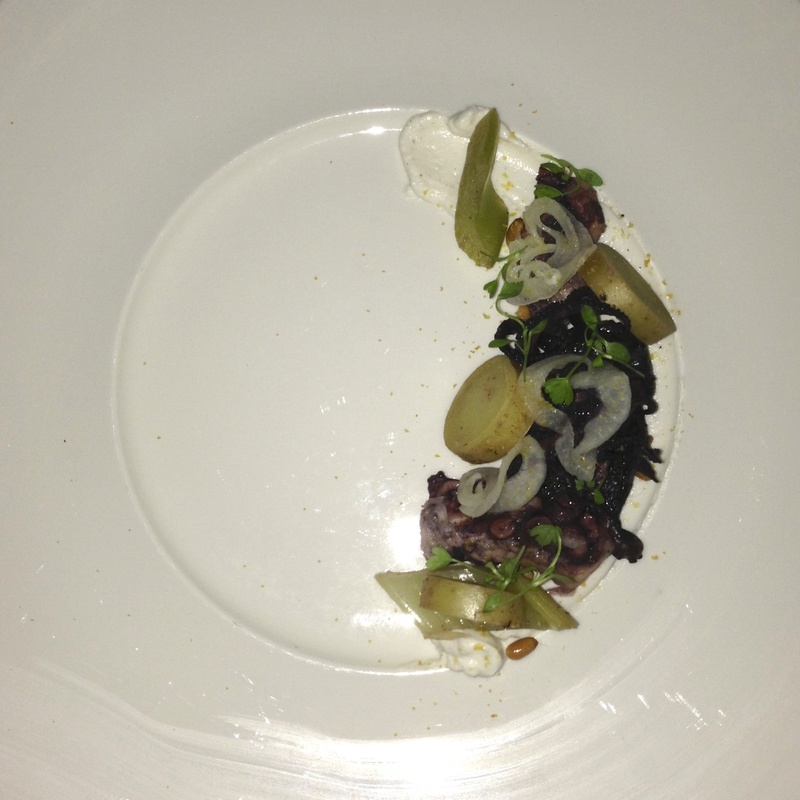 I’ve always wanted to try a Chef’s Tasting menu of some kind, and when I heard No. 9 Park had a Pasta Tasting menu I knew this would be perfect for us. What’s also perfect is that one of our oldest and best friends happens to be one of the sous chefs at No. 9, and each sous chef gets his/her turn at preparing these pasta dishes. The descriptions below are details I received directly from the No. 9 kitchen, courtesy of my dear friend Chef Benno. The menu typically comes with 6 courses including the dessert. 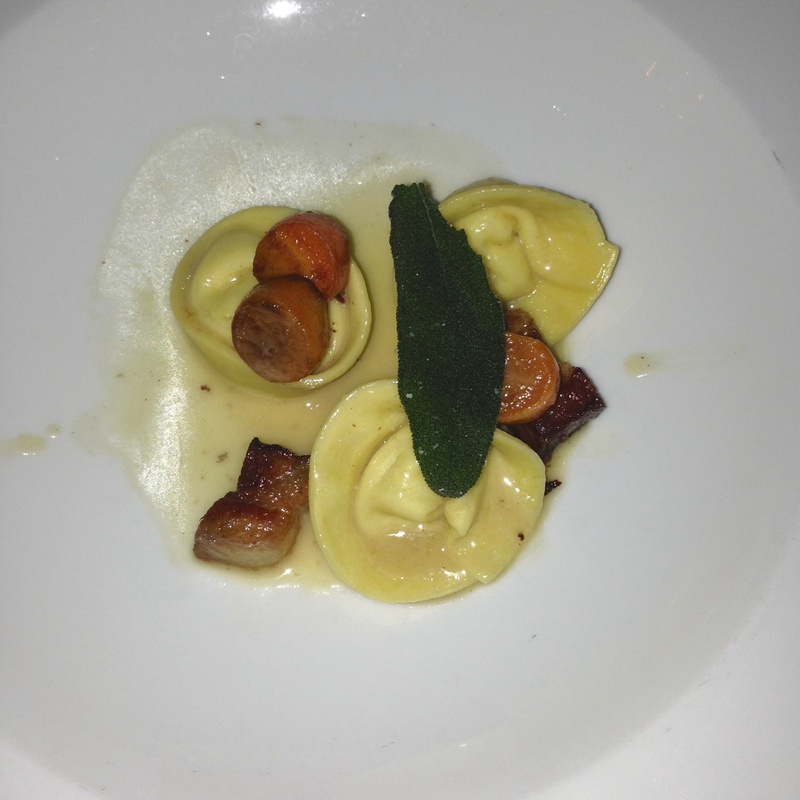 There is an option for an additional course (served as course 4), which we had the pleasure of being served. Don’t ask me to choose a favorite course, because it’s nearly impossible! 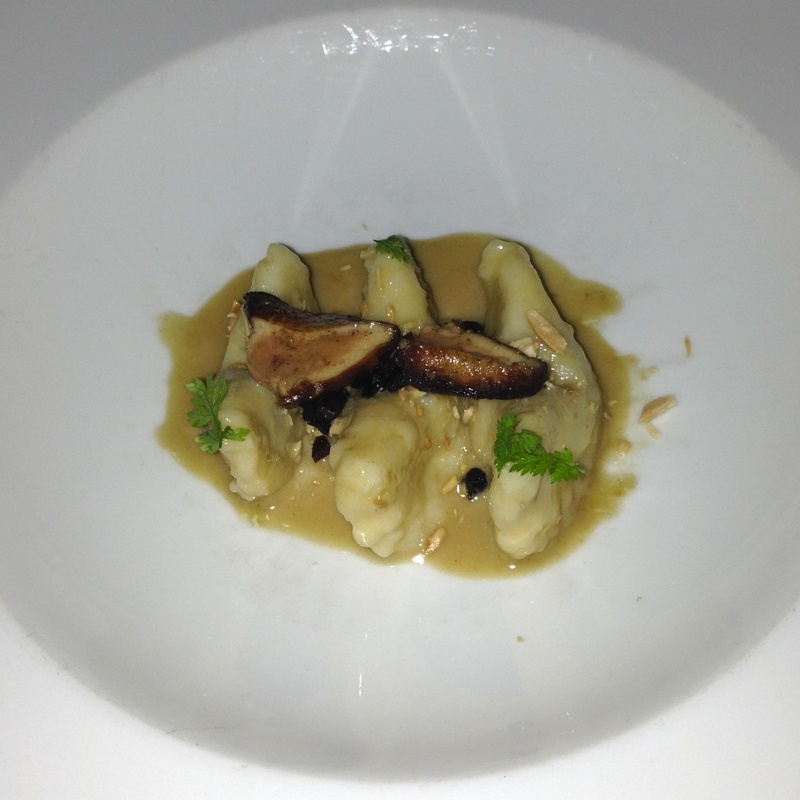 However if I must narrow it down my top 3 are: Bigoli with crab, Cappellacci, and the prune-filled Gnocchi. Spanish and baby octopus are braised in red wine, olive oil and aromatics. The baby are left whole and the Spanish are cut into segments. They are warmed to order in the braising liquid with some boiled fingerling potato coins and celery rib diamonds that have been peeled and braised in vegetable stock, white wine and lemon juice. This sits on top of whipped and smoked ricotta that has been seasoned with black pepper. Garnishing the plate are pickled cippolini onions, toasted pinenuts, and grated bottarga. No. 9’s standard pasta dough (flour, semolina, eggs) is seasoned with a puree of Nasturtium and rolled into bigoli. 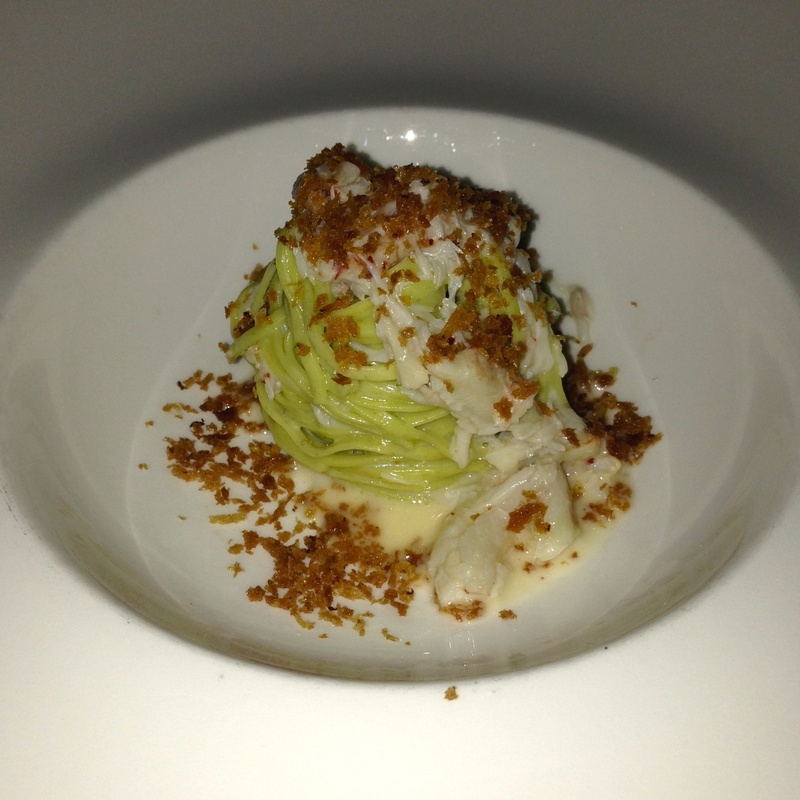 The pasta is tossed with peekytoe crab and a butter sauce seasoned with white wine and tangerine juice. Breadcrumbs toasted with the zest of the tangerine finish the plate. No. 9’s standard pasta dough (flour, semolina, eggs) is rolled out and filled with plaesentif di viole, a cow’s milk cheese from northern Italy. Chantennay carrots are roasted along with bacon confit. A pan sauce is made with a little butter, jus and aged balsamic. The plate is topped with fried sage and pecorino. This is a No. 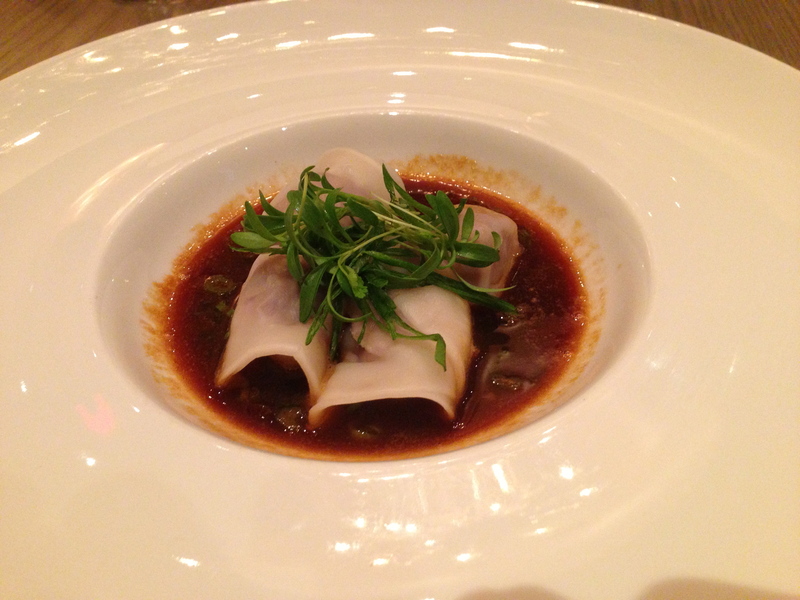 9 Park house signature dish. It’s a standard gnocchi dough filled with prunes cooked down in vin santo. The sauce is made from foie gras and butter. It’s topped with slivered almonds, diced prunes and seared foie gras. 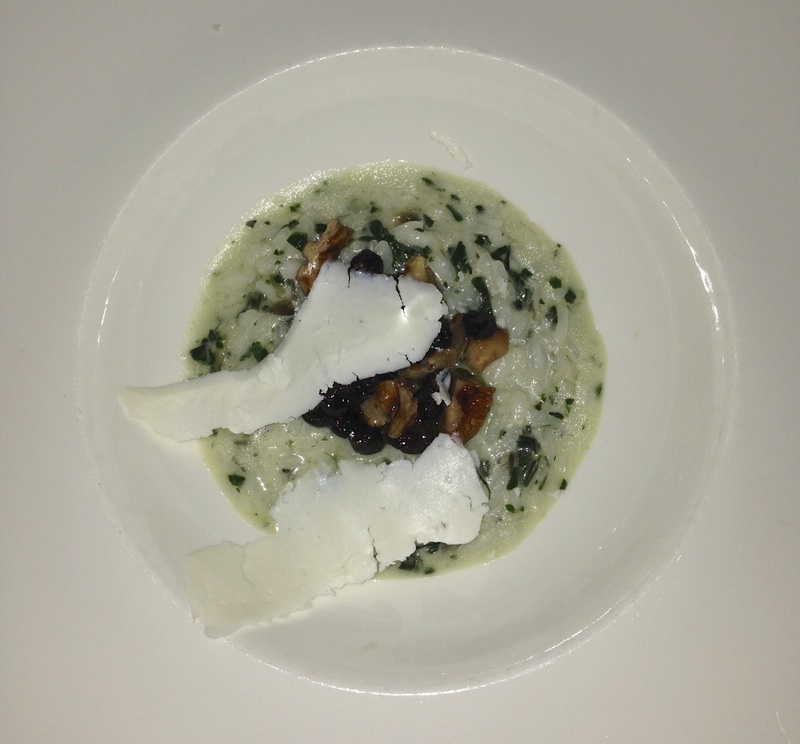 Carnaroli rice is cooked risotto style and finished with braised and ground swiss chard as well as lemon whip. Topping the rice are pecans and currants dressed in EVOO and sherry vin. Ricotta Salata to finish. Beef short ribs are braised in red wine, pulled apart and the meat is glazed with jus seasoned with cocoa. 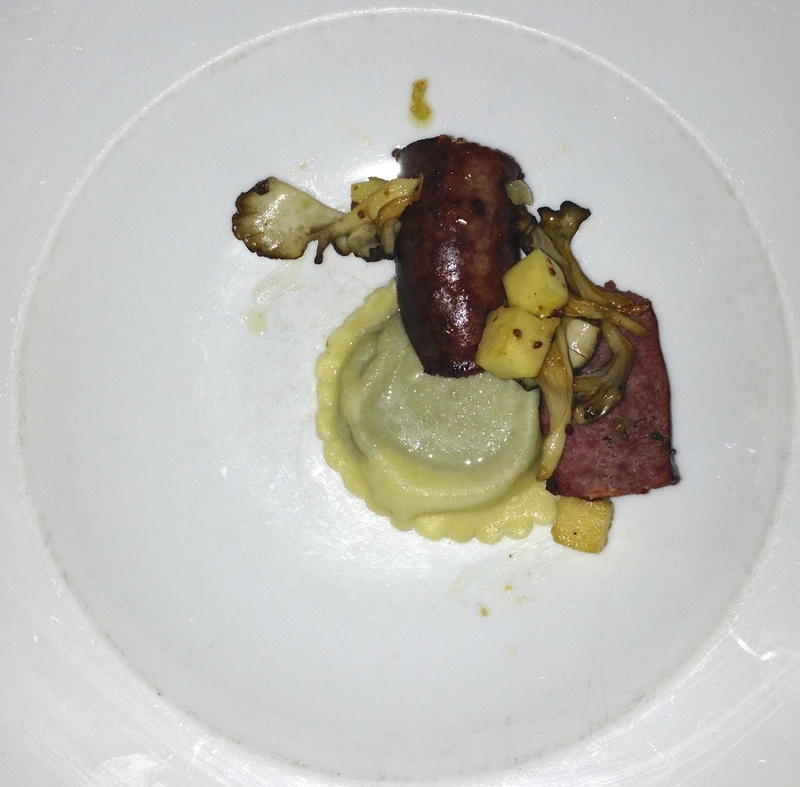 This is used as a filling for a raviolo that sits with roasted hen of the woods mushrooms and beef sausage seasoned with pork fat parsley, white onion, and chili. Quince mostarda finishes the plate: quince, white onion, white wine, sugar, dijon and whole grain mustard. 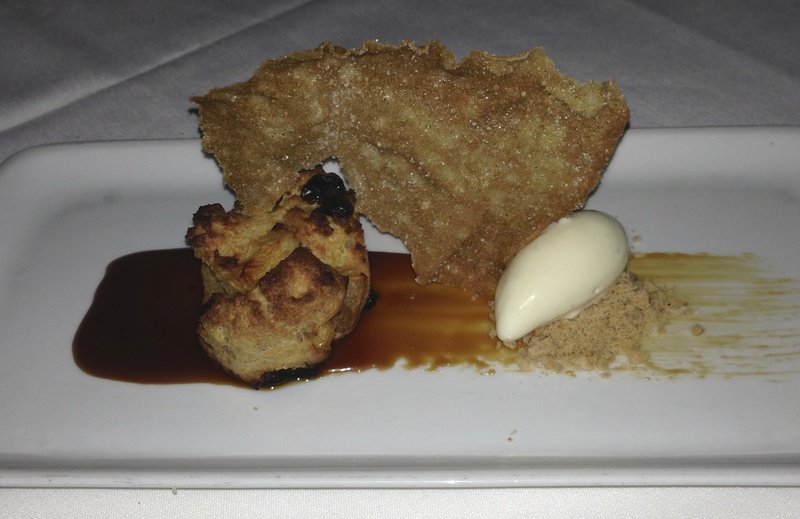 Bread pudding is made from apples cooked out in calvados, brioche, eggs, cream, sugar and cookie spices. It sits on a caramel sauce made with reduced calvados. Mascarpone glace finishes the plate. When my good friends from the Columbus Hospitality Group asked me to come in and try Mooo‘s new Sunday Brunch I absolutely could not resist. I have only been to Mooo once, and it was for dinner about 5 years ago. I can’t remember what I ordered but I know I left impressed and more than satisfied. 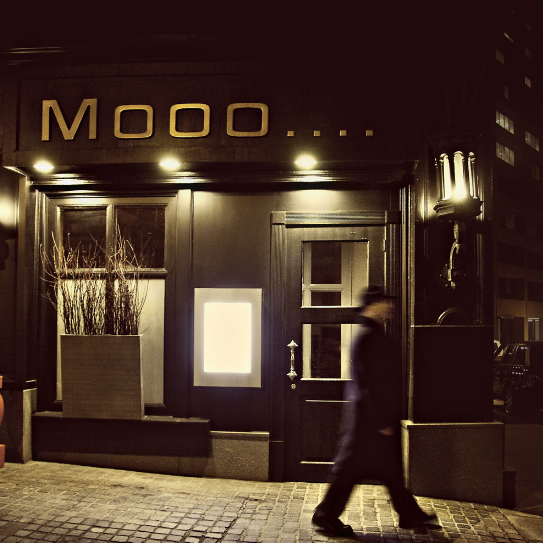 As Mooo is located in the XV Beacon Hotel, it is open 7 days a week and offers breakfast, brunch, lunch, and dinner. 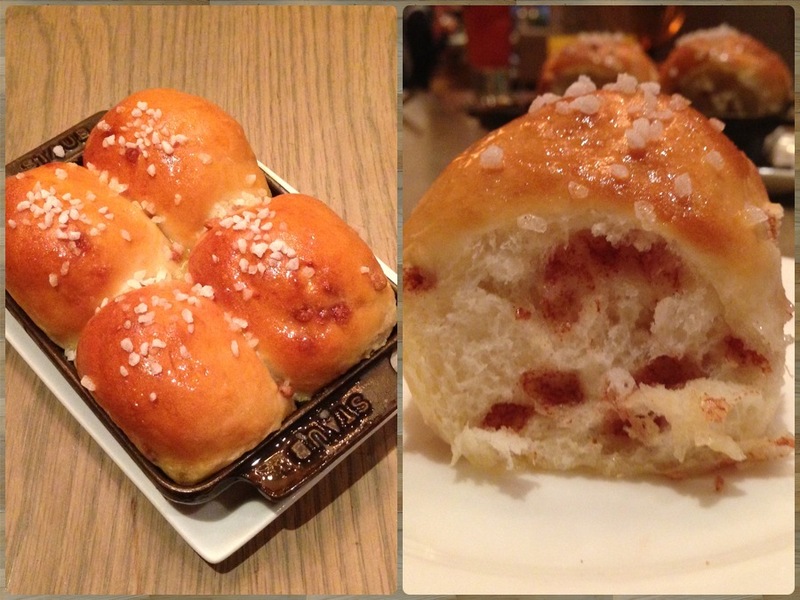 The brunch menu has been recently revamped and I was one of the first to try the new offerings. Let begin with cocktails! The drink menu features 3 signature concoctions as well as a variety of Bloody Mary’s. I’m a huge Bloody Mary fan but wanted to try something outside my comfort zone and went with the Honey-Bee: Hendrick’s, house-made thyme honey syrup, and St. Germaine. 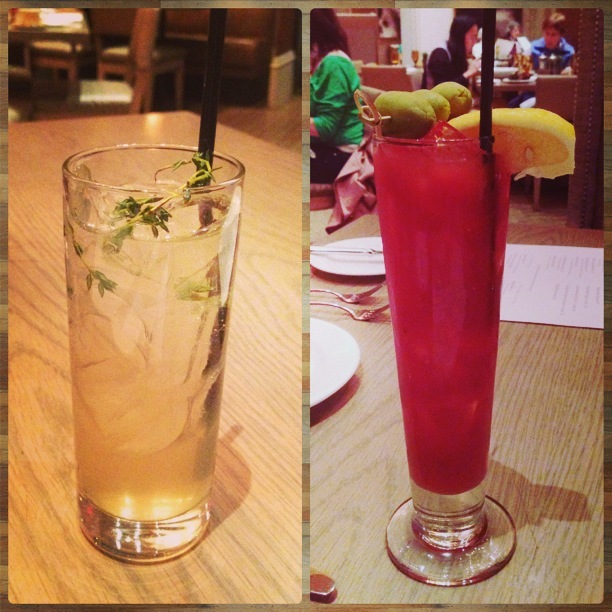 Luckily my husband ordered a Bloody Mary that I was able to taste, however he went with the classic version. 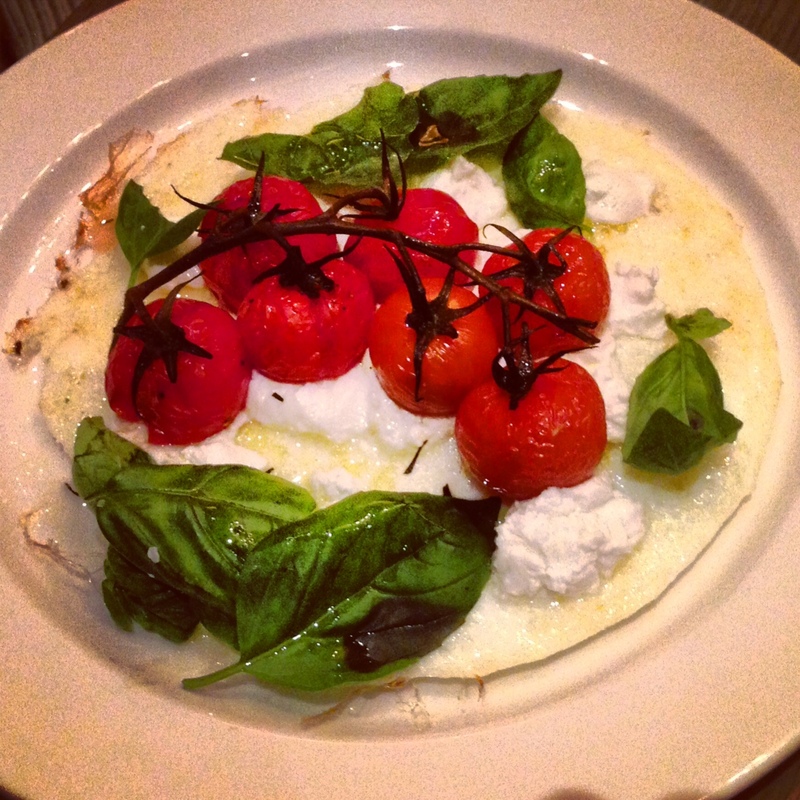 I personally would have tried the Bloody Caprese with an addition of fresh mozzarella. I’ve never had cheese in a drink before but I’m not one to turn down mozz. The menu is broken down into sections: Juice Bar, Appetizers, Eggs, Specialties, Steak & Eggs, Sandwiches, With Maple Syrup, Sides. If it wasn’t for my cocktail I would have ordered the Lean & Green Monster Smoothie. I was thinking of making that my appetizer but instead we ordered the Kobe Dumplings, a Mooo signature dish. 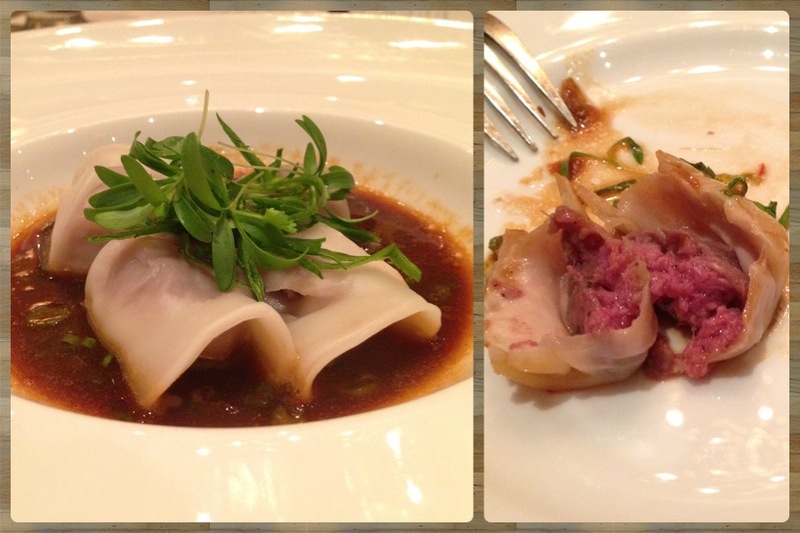 Four steamed dumplings stuffed with Kobe beef sat in a salty soy broth. Every part of this dish just about melted in your mouth! Next time you’re at Mooo I suggest trying the Kobe beef in any fashion it’s offered. Whenever I go out for brunch I always want to order a sweet meal like Belgian Waffles, but always end up ordering a savory egg dish. This time was no different as I picked an item from the Specialities section, the Poached Eggs & Salmon complete with savory bread pudding, dill crab hollandaise sauce, and roasted tomatoes. The eggs were perfectly done, soft and fluffy on the outside and runny on the inside. 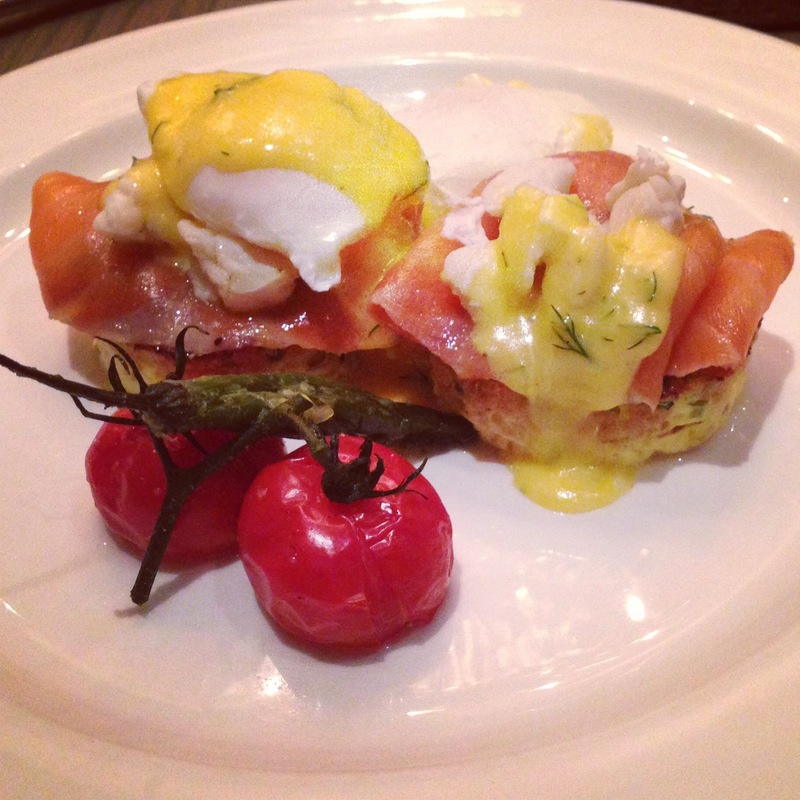 There was a large amount of salmon under the eggs which topped the eggy bread pudding. 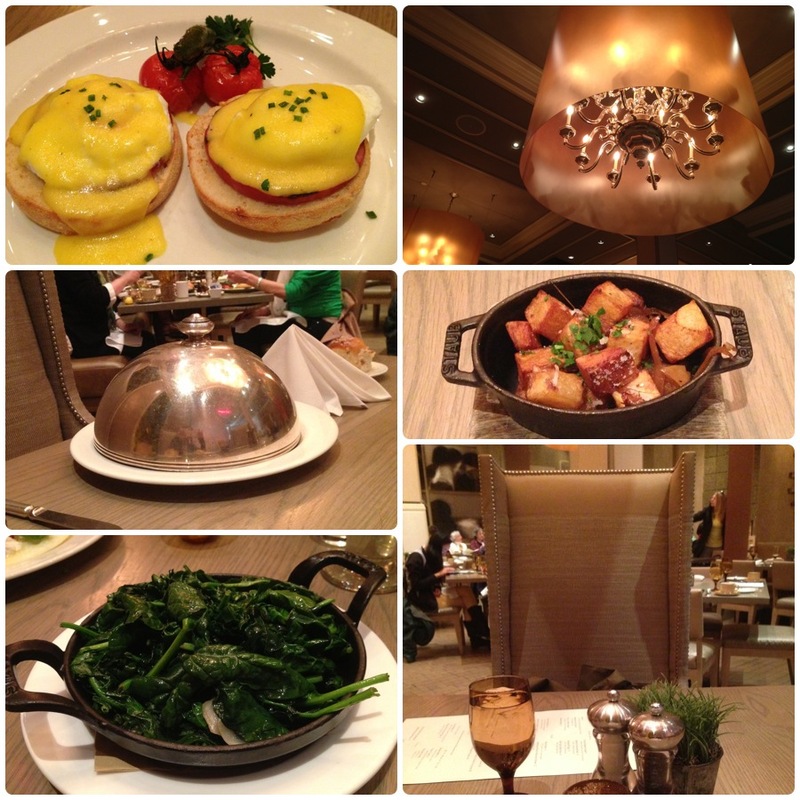 Overall Matt & I really enjoyed the brunch experience. Our server was great and checked in on us at just the right times. He even placed a warmer over Matt’s dish since Matt was in the bathroom when our meals arrived. The menu had a nice variety of options, the high-backed chairs made for a comfortable meal, and the live mood music in the background was a perfect touch. 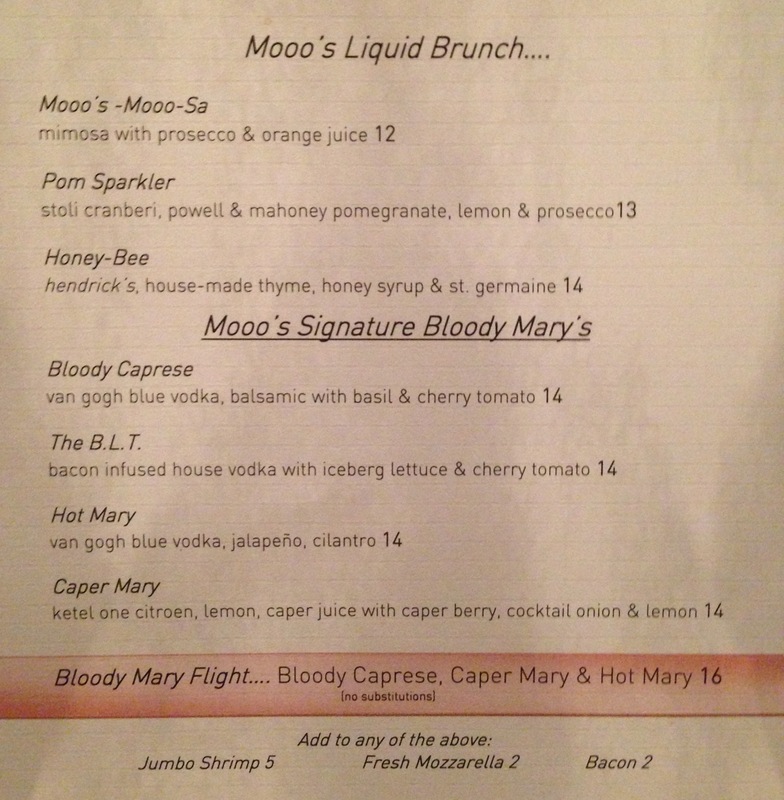 Next time you’re planning brunch I suggesting making a reservation at Mooo. Order the Bloody Mary Flight and tell me how it is!